Nigeria Football Federation President, Amaju Pinnick says the duo of Chelsea’s Ola Aina and Arsenal Chuba Akpom are willing to don the green and white colours of the Super Eagles. 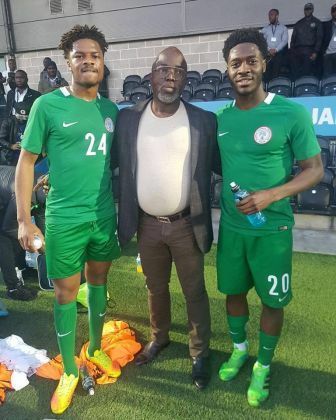 Pinnick who was with the team in London after Nigeria’s 1-1 draw against Senegal in an international friendly match at the Hive Stadium and the their 1-1 draw between team A and team B, where the likes of Aina and Akpom don the colours of their fatherland. The former Delta State sports administrator, told Soccernet.com.ng exclusively that the duo of Aina and Akpom are interested in playing for the Super Eagles in subsequent games if called upon. “It’s a good development that we had quality players such as Ola Aina and Chuba Akpom turn up to play for the senior national team in London. I am quite impressed with their attitude and commitment on that very game between team A and team B,” Pinnick told Soccernet.com.ng. ” Besides, this goes to show that they are willing to play for Nigeria ahead of the Three Lions of England. They will be added value to our 2018 World Cup qualifying quest because of their quality. “They have shown that they wants to commit their future to the Super Eagles and I will be glad if they accept our invitation before facing South Africa in a 2019 Africa Cup of Nations qualifier in Uyo on June 9,” he said. Stand-in skipper Ogenyi Onazi led a Team ‘A’ side comprising of Daniel Akpeyi, Leon Balogun, Ola Aina, William-Troost Ekong, Elderson Echiejile, Wilfred Ndidi, Oghenekaro Etebo, Kelechi Iheanacho, Moses Simon, Alex Iwobi. The Team ‘B’ side captained by Kenneth Omeruo had Ikechukwu Ezenwa in goal, Tyronne Ebuehi at right-back, Chidozie Awaziem, Juwon Oshaniwa at left-back, Shehu Abudulahi, John Ogu in central midfield, Kayode Olanrewaju, Isaac Success, Ebere Eze.